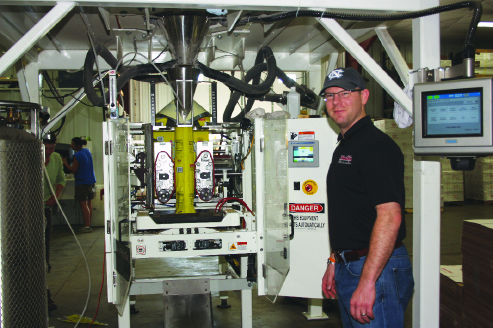 Riley Dandurand, general manager of Dakota Style, is shown near a sunflower packaging machine at the Dakota Style building in the Clark Industrial Park. In the background are employees Terri Bremmon and Katie Wangsness. With 25,000 points of distribution, sales have increased dramatically, and the company is expanding, adding second shifts at both the potato chip plant and the sunflower seed packaging plant. The packaging plant opened in February. Dakota Style continues to put Clark, S.D., on the map—most recently with a booming business in sunflower seeds and kernels. A new warehouse/office space is now in use at the Clark Industrial Park, primarily for sunflower seed production. The Dakota Style brand started with potato chips, but sales of sunflower seeds have surpassed chips sales for the company. Dakota Style revved up their sunflower seed expansion in 2006. “That was when my father brought me on board,” Dandurand said. Dandurand’s father, Kevin Dandurand, purchased the business in 1998, and since then it has become a family affair with the addition of Riley as general manager and his brothers, Eric and Dustin, in sales. The Dandurands are originally from Aberdeen, and Riley, having come from Detroit and Toledo with a former job in sales for the 3M company, appreciates being back in South Dakota. Dandurand, with a degree in psychology, biology and chemistry from St. Mary’s in Minnesota and a master’s in business from the University of Toledo, came on board to help his father with finance, production and marketing. Ryan Sheplak of Kansas City, Mo., was brought in to help with sales, having 20 years’ experience in the food business. With the increase in sales, brother Dustin was also needed. He was formerly with 3M in Buffalo, N.Y., and Boston, Mass. He is now located in Des Moines, Iowa. “From Canada to Mexico and from Denver to Chicago, that is our primary market area,” said Dandurand. Several national leaders in grocery stores and big chain stores are Dakota Style customers now. Grocery stores are the first market for sunflower seeds with the convenience stores marketed next. Sunflower seed sales have taken off, with a 50 percent growth this year over the last year. Sales of kernels (seeds without the shells) and sales of in-shell seed sales are split about evenly. As Americans become more and more health-conscious, the seeds, which are rich in vitamin E and are a good energy source, have been a popular snack. Servicemen and women are among the most ardent fans. In-shell, 16-ounce bags are the No. 1 selling seed in the country per point of distribution, meaning for every place is on the shelves, it sells better than the others, Dandurand said. By the end of 2012 Dakota Style’s kernel sales will be national—all contiguous 48 states will have them. They also have in-shell seeds in Alaska. For the last 18 months, the company has also been marketing kernels as a healthy salad topping, with the flavors of roasted, ranch, zesty and honey roasted. The products have been steadily gaining sales. The company currently has 14 workers at the original location northeast of Clark and five employees at the warehouse on Industrial Road in Clark. Their expansion calls for more warehouse space, more jobs and more lines of more flavors in the future. By Nov. 1, Riley expects 80 percent of their workforce to be in Clark, including all of their office personnel. “The chip plant will stay where it is, and all of the chips will continue to be made there, but all the shipping coming and going out on semi-trucks come to the Clark location,” he said. He estimates at least 25 semis come to the Clark location each week. “The chips continue to do great,” the Dakota Style general manager noted. Sales are concentrated primarily in the convenience stores with the smaller bag size showing good growth. “First thing when I came on board, I added the new spicy flavors. I think Ranch is the new ketchup. Spicy Ranch is my favorite,” Dandurand said with a smile. Dakota Style Chips was originally founded in 1985 by Bob and Betty Campbell as a way to subsidize a struggling agricultural market. The Campbells began producing open-kettle potato chips cooked in cottonseed oil, and their recipe continues of the plant. “If it ain’t broke, don’t fix it,” Dandurand says. Speaking of additions, Dandurand and his wife, Ashley, are expecting their own addition in September. Ashley is currently working at the Little Explorers daycare in Clark. The couple married at the end of last year with Ashley moving here from Burnsville, Minn.
“Having been away from it, I really appreciate being back in South Dakota and small-town lifestyle,” Dandurand said.